All Aboard! Christmas Train Rides in Vermont. Christmas will be here before you know it and you know what that means. Santa Claus is coming to town! Several towns throughout the state are having Christmas Train Rides to celebrate his arrival and I am sure we will all be excited to meet him, no matter what our age. Come to Burlington, Vt on November 26 – 27 and take ride on the 4th Annual Jingle Bell Express. Hosted by the Ronald McDonald House, this is by far their largest and most popular fund raising event of the year. This is a fun and festive train ride that takes you from Main Street Landing in Burlington to Charlotte and back. Everyone will receive a Goodie Bag loaded with items from local businesses. You will also be treated to a sing-a-long, visits from Frosty and others and who could forget the man of the hour, Santa Claus himself. All proceeds from this two day event stay right in Burlington allowing them to serve hundreds of families with seriously ill children seeking medical assistance at the University of Vermont Medical Center. 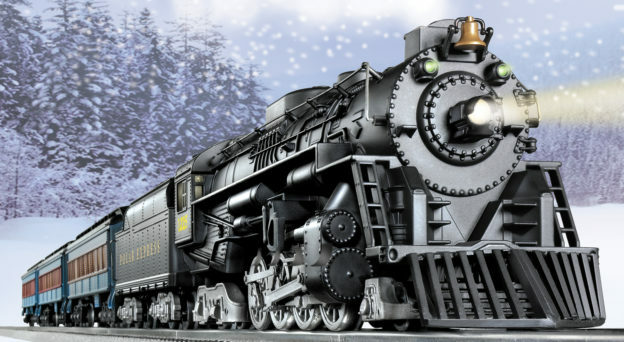 The North Pole Express is December 3-4 , in Lyndonville, VT. Experience the old time magic of Christmas aboard fully enclosed and heated vintage coaches as you travel to The North Pole to pick up lively elves, Mrs. Claus and of course, Santa. Snuggle in (pajamas are encouraged but not required) for story reading, hot cocoa, gingerbread cookies and caroling on the way to The North Pole where Santa boards the train and greets all passengers and presents them with a special gift. Tickets sell fast, so make sure you make your reservation soon. 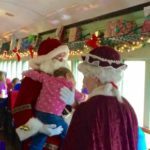 All aboard the Santa Train 2016 in Rutland, VT on Saturday , December 3rd. 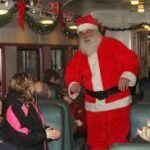 Presented by Diamonds and More the Santa Train embarks from the Rutland Amtrak Station for a 45 minute ride that takes you through Santa’s Village. The beautifully decorated train includes refreshments, wonderful stories, songs and much more. This will be the most enjoyable and memorable Christmas experience ever! This is a one day event so make sure you don’t miss out. There will be 5 departure times throughout the day. Who knows, you might even get to meet Santa himself. Of course, you don’t have to go on ride on a train to enjoy the Christmas festivities. 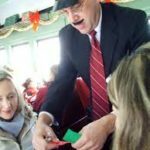 Essex Junction, Vt is having their 8th Annual Essex Junction Train Hop and Tree Lighting on December 9th. Come to the Village for the tree lighting at 6:15pm. See Santa at the Teen Center. 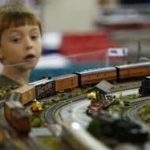 Businesses and community partners throughout Downtown Essex Junction will be hosting model train displays or train/holiday related activities. Maps will be be provided to visitors identifying Hop Stations at the participating locations. Wander around the Village enjoying all it has to offer. New this year, several area restaurants are offering specials for Train Hoppers. Just mention the Train Hop to take advantage of these specials. If you are lover of the Big Bang Theory you know how much Sheldon Cooper loves trains. Who knows, maybe we should send him and invitation to see if he shows up. Next stop, White River Junction, VT for The Hartford VT Polar Express on December 10-11. Enjoy an exciting hour long ride along a river where you will end up at North Pole. Children of all ages will be read the Polar Express and enjoy holiday sing-alongs while drinking hot chocolate and homemade cookie . Once at the North Pole, Santa boards the train to greet every child. Keeping with the tradition of the Polar Express, every child will get their first gift of the season, their very own Polar Express Bell. Once you return to the station, you can have your picture taken with Santa, enjoy a nice hot lunch, and browse through the Polar Express Gift Shop. Finally, we make our way to Manchester, Vt where the Lions Club presents The Elf Express on December 17 – 18. This whimsical holiday train will leave r.k. Miles Depot Station on a one-hour journey through the Green Mountains of Southern Vermont. 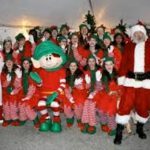 You will be entertained with holiday songs and dance routines by the elves of the theater and dance program of Burr and Burton Academy under the direction of Broadway and Hollywood song and dance man, Jim Raposa. 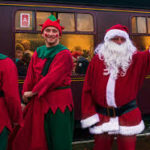 Refreshments will be served on the train and, adding to the memories, the elves will be read a special story about Christopher Pop-In-Kins, who will also be hiding on every train to see who’s been naughty or nice! Mr. and Mrs. Santa Claus will make a surprise appearance when they and the elves help board passengers for a ride of a lifetime. This is a Pop-In-Kins adventure you don’t want to miss. So grab your family, get in the holiday spirit, and take a ride on a holiday train ride. For these holiday events and more, be sure to check out the Vermont.com Calendar of Events. Want to see what the weather will be like? Go to the Vermont.com Weather page. This entry was posted in Activities, Burlington, Now Trending, Things To Do on November 6, 2016 by Linda Cassella.